The Howbeck Guest House Guest HouseFor accommodation, The Howbeck truly is a once discovered, never forgotten place to stay. A delightful Lake District retreat where the warmth and friendliness of staff is always apparent. Here the guest really does come first and there is no time you won't be made to feel welcome. 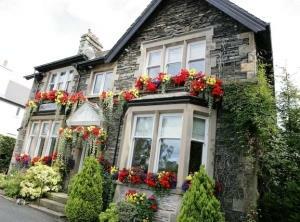 The atmosphere is one of an elegant comfortable private Cumbrian house and friendly luxurious hotel rolled into one. Born of a desire to provide perfection, your hosts have a passion for creating that special retreat and rooms continually receive loving attention to keep them just right. Highest standards are the norm - everywhere is spotlessly clean and bright as a new pin. Ten spacious en suite rooms, 4 superior, 5 luxury, 1 luxury premier room and a luxury suite, some ground floor. The Hotel is renowned for its good food, lovingly prepared from fresh and wherever possible local ingredients and the day starts with the famous hearty Cumberland platter breakfast. Windermere is the central location for touring The Lake District and The Howbeck is ideally situated an easy stroll from the main village. A private car park provides ample parking and for those on foot the station is an easy 5-minute walk. For accommodation, The Howbeck truly is a once discovered, never forgotten place to stay. A delightful Lake District retreat where the warmth and friendliness of staff is always apparent. The Howbeck Guest House sometimes limits bookings to 3 or more days. Luxury 4 Poster sometimes limits bookings to 3 or more days. Luxury suite with a private patio and water feature. Solid oak floor, leather sleigh bed, flat screen TV/DVD, mini bar and private dining/living area. Luxury double air spa bath, walk in jet shower, chromotherapy mood lighting and flat screen TV in bathroom. The Retreat sometimes limits bookings to 3 or more days. From M6 jct 36 take the A591 to Windermere. Turn into Windermere at the railway station. Follow one-way system through village towards Bowness. The Howbeck is on the left hand side about 300yds beyond the end of the one-way system.